Anyone who knows me knows that I am particular about my gift wrapping. I like things to match, and I like them to have a distinct flair. I’m the one with the color coordinating bows, paper, ribbon and gift tags on Christmas morning. In fact, I have 5 different sets of Christmas ornaments, because I like to coordinate everything. So, how do I do it without breaking the bank? There are a couple of tips and tricks that I use. 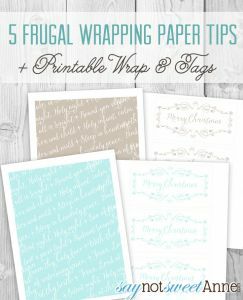 Buy paper and ribbon on sale in January and then store it until the following Christmas. Use your printer. For small gifts I love to design my own wrapping paper. I print it on a premium printer paper for thickness, and then wrap it up. I love that I’m able to customize for the event, for the recipient’s taste this way. It is so fun! This year I’ve done a Silent Night theme, using the lyrics from the song and some soft colors. I made coordinating tags and I’m sharing it all with you! Double stick tape. “Premium” papers with glitter are super expensive! 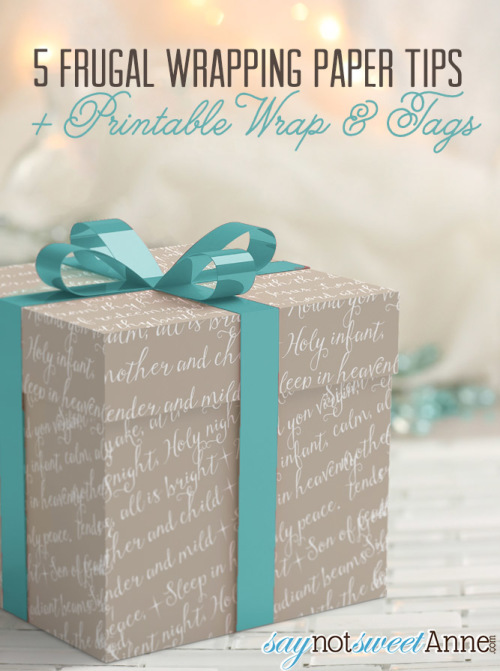 Dress up any wrapping paper with some double stick tape and your favorite glitter. 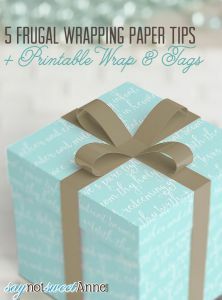 Simply wrap the gift, apply a band of tape, dust with glitter and shake off excess. Voila! Your own premium wrap! Finally, save your boxes. So much wrapping paper is wasted trying to wrap strangely shaped items and toys. For months before the big day I save my shipping and packaging boxes, and then re-use them for nice, square gift boxes! I love these, so pretty. Get tired of red/green holiday colors. They don’t go in our home anymore. Using aqua/light tan is great idea. Thanks so much Jane for your kind words! !